WILLIAMSTON, S.C. - The Gripp Energy Limited Late Models made their final trek down to Anderson Motor Speedway in Williamston, South Carolina on September 21. The points battle is beginning to take shape, current points leader Dillon Houser went into this race 13 points over Jesse Clark and 16 over John Gallman in third. Newcomer to the series Josh Goble, has been picking up the pace steadily each and every week in the John Mamph Blackbear Motorsports entry. The teams made their way to the track for a fun Friday under the lights night of racing. They unloaded and prepared to make their runs in the first round of practice. Houser who has three wins alread this season in the Dwight Huffman Racing #11, topped the speed charts followed by rising star Tanner Brookshire, Gallman, Goble and TJ Williams. They had one more round of practice before qualifying. Houser once again showed his strength and determination, as he posted the fastest time in the final round of practice, Goble, Brookshire, Clark, and Ralph Carnes rounded out the top five. The teams made their way through tech inspection and lined up for qualifying. Tanner Brookshire advanced from practice and claimed his first pole award of the season with a lap time 16.205. Brookshire rolled a five on the invert dice which now placed Houser to start on the top spot with Clark starting on his outside. Houser followed the City Chevrolet pace truck around the track for the warm up laps before the start of the race. Flagman Timmy Hutson waved the green flag in the air, and they were off. However before they could complete the first lap of the race, Brookshire who was already trying to work his way back up towards the front made contact with Carnes in turn two, resulting in Carnes spinning. Houser once again paced the field back to the green flag, he knew he was going to have to be on his toes this race as the points battles were getting closer. As they made the fourth lap around the speedway under green, Goble was determined to push his car to the limits, and take over the top spot from Houser. Goble brought Clark and Gallman with him during his march to the front. Gallman then went to work on Clark battling for second position, which he was able to take after a few laps. The field then made their way towards the halfway mark of the race, and Carnes who had now worked his way back through the field found himself on the rear bumper of the leader, of Goble. The second caution flew just a few laps later on lap 28 as Brookshire and Davey Smart were racing hard for position and got together. Goble who has had a ton of experience in late models over the years, (the former Late Model Track Champion at Tri-County Motor Speedway) hit his marks and had a excellent restart. Gallman was now all over the tire tracks of Goble and Carnes mixing it up for a three way battle over the lead. Houser had now worked his way back inside the top five, and was looking at the battle in front of him, slowly gaining on the top three drivers as they battled it out. The third and final caution flew on the night as Brookshire and Houser made contact on the track, resulting in Houser spinning around. Houser gathered it back up and rejoined the tail end of the field. 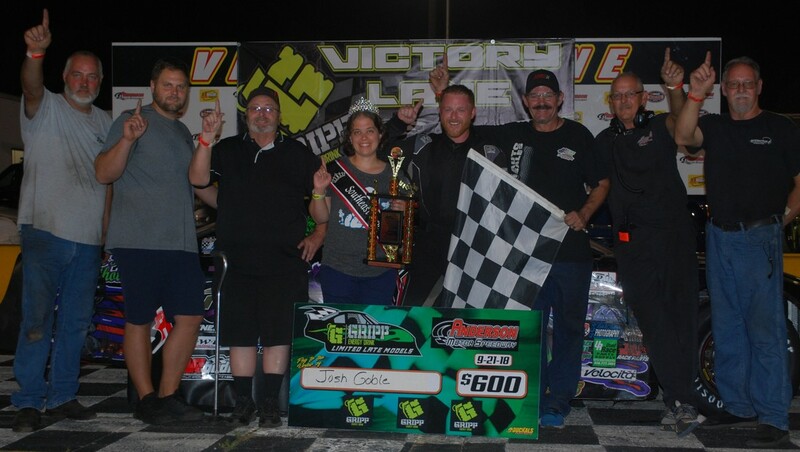 Josh Goble went on to capture his first victory in the GELLM's. He was followed by Carnes in second, and Gallman in third, Chris Smith (picking up his best finish since moving up from Front Wheel Drive's) in fourth, and rounding out the top five was Brookshire. The series will invade the Tri-Cities of Tennessee on October 6th, and the Gripp Energy Limited Late Models will be doing battle in Twin 35 features to make up for a rained out race earlier in the season. So come on out this Saturday night and see what all the commotion is about with the Southeast Super Truck Series, the "Most Awesome Show On Wheels".